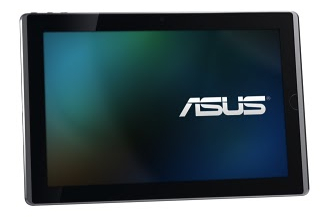 Asus showed off the first Android tablet powered by a quad-core chip at the AsiaD conference on Thursday morning. The Asus Transformer, currently available with a dual-core chip, uses Nvidia’s(s nvda) newest system on a chip (SOC), dubbed “Kal-El.” The faster, updated Transformer isn’t yet for sale, but Asus is holding a press event in early November, where it’s expected to announce pricing and availability. Unfortunately, Asus hasn’t said if the refreshed tablet will first arrive with Google Android Honeycomb(s goog) or Ice Cream Sandwich. If the new Transformer arrives with the Google’s current software, it will surely see an upgrade to Ice Cream Sandwich, known as Android 4.0. That software refresh will do far more for the Android tablet market than more powerful hardware, thanks to new software features and user interface tweaks. I’m not suggesting that Nvidia’s silicon isn’t needed nor impressive. Early video demonstrations of the Kal-El chip — which also has a dozen graphics cores — show incredible game fluidity and superb lighting effects. As a hardware addict, I welcome the advanced chips that Nvidia and others are bringing to new devices. But hardware isn’t the problem. If faster chips alone meant “winning” the tablet war, Android would have had the edge. When the first Android 3.0 tablet — Motorola’s Xoom(s mmi) — arrived in February, it had a dual-core chip. Apple’s iPad(s aapl) didn’t gain two cores until the April release of the iPad 2, but the Xoom didn’t even dent the tablet market compared the iPad: Motorola has shipped (not sold) 690,000 units in the first two fiscal quarters of availability, while Apple sold 11.12 million iPads in the last quarter alone. Motorola’s next investor call is later this month, so we’ll see if Xoom shipments have increased or not. Why the huge difference in sales? For one, the Xoom’s hardware wasn’t quite complete as it took more than six months to bring the promised LTE mobile broadband radio to the tablet. But more importantly, the interface was fairly muddled and few software applications were created to take advantage of the form factor. Many existing Android smartphone apps ran on it, but added no extra benefit to go with the larger screen. The Xoom is just an example; no other Android 3.0 tablets have rivaled the iPad’s sales either. Even collectively, Android tablets are outsold by the iPad at least five-fold, if not more. While hardware is still an important enabler of mobile devices, gone are the days when the “most powerful rigs” are the best. Software, services and user experience are equally valuable, if not more so. Until Android 4.0 arrives on tablets, all the computer cores in the world aren’t likely to radically change the mix of tablet sales by platform. When Ice Cream Sandwich does arrive, that’s when Android will better compete with iOS in the tablet market, because all of the pieces of the successful tablet puzzle will be put together. Capable hardware in the form of chips from Nvidia and others combined with forward-thinking apps that take advantage of the hardware will start to make a difference. Add in Ice Cream Sandwich’s much improved, consistent Android user interface and then we’ll see if Android tablets are ready to take on the iPad. Still missing the consume element. Android camp just getting the hardware right!!! Follow the lead of amazon, as asus has just gotten the pricing and the hardware right!!! Still, this cannot dent the appeal of Kal-el and it anticipation among millions of loyal android fans (?) who have been awaiting a gaming rig Tablet, which Quad-Core processors afford. expect to see longlines for this product that is possibly the first gaming rig tablet!!! What the hell are you going to play on Android that needs a quadcore and a high end GPU? Legend of Nothing? Return to Nothing? Another reason for the sales difference between Android “tablets” and the ipad is categorization. Let’s not forget that one of the best selling Android tablets is excluded from these analysis, the Nook Color. It’s easy to make apple look good when you eliminate top sellers form the category. They have been asked whether ICS is going to be introduced before the end of the year and the answer was – even sooner. Given the release is mid Nov I would say that its going to be released with ICS. They are silly not to. And they are usually very smart about what they do. In the 500$ range I join Lucian in expecting it to have a keyboard included, but then all indications are that they will not do that. Pitty. In any case, I don’t think that Android house/office tablets (e.g. 8.9″ or 10.1″) are going to be a hit before adding/enhancing their productivity content portfolio. iPad is considered a much better option for that. Actually if Apple created a Macbook Air 11″ with a sliding keyboard and a touch screen … I would have been much more tempted to buy it than an Android at this point in time. Due to the above concerns about productivity applications. HoneyComb interface on tablet is too “busy”, “un-inviting”. Why ipad selling like hot cake? Studying/copying is the interface of ipad is such an easy task. Simplify-Simplify-Simply!!! I tend to agree. I’m not a fan of the overall Honeycomb interface and actually prefer Gingerbread on my 7-inch Galaxy Tab. We’ll see how ICS looks on tablets soon. Simple can be harder than complex: you have to work hard to get your thinking clean to make it simple. But itâ€™s worth it in the end because once you get there, you can move mountains. I don’t think ICS is going to help the Android tablet market at all. Why do I think this? Because it appears that ICS is basically just a newer version of Honeycomb. Which is terrible. The interface is still a disaster, with controls scattered haphazardly on each corner of the screen. Perhaps they’ve polished the code base a bit, maybe it will run a bit faster, and they’ve added a few new features, but but what they really should have done is just started fresh, and re-thought the entire interface. If you’re going to build a good tablet experience, Honeycomb is not a good place to start. I’m not so sure. First there is the issue of “value” added SW by the HW provider. Smasung text select works differently on Honeycomb email then gmail text select. A unified inbox seems to be [to] complicated for Google. Then if one stands back. Is a tablet a “standalone” data access device or a data consumption/manipulation device in a “chain” of possibilities? iCloud against Google apps/docs, one has the integration on OS level one has a hacked lib somewhere because it’s not done very well. While ICS has better or so it looks integration of gmail/calendar(seems to have a better API] it has to be seen how it works in a “chain” of connected devices and data and what the “value” added guys are going to do to screw it up. Specially if I have a phone from MOT and a tablet from Samsung. It might be better if we are all on ICS. But that is how far out 2-3 years? There are several sites confirming this morning that the Transformer Prime will run ICS. The link you posted uses another site as a source. When I read that source, I found: “Asus is planning to officially launch this tablet on November 9, though there’s no word yet on whether it will come with the latest version of Android, Ice Cream Sandwich (ICS). ” That’s what the original source (AllThingsD) says as well. Regardless, I’m sure the device will eventually run ICS, even if it doesn’t at launch. Thanks! I think Asus will become the biggest seller of Android tablets, and they’ll sell quite a few millions of them in the coming months. The reason everyone is excited about it, is not only because of the Asus UX21-like aluminum body design, ~15h battery life, and a quad core Kal-el which should be great for multi-tasking and browsing (Kal-el uses all cores for browsing), but because Asus is showing us the evolution of tablets, netbooks and laptops. I believe devices like the Transformer will become more and more popular in the near future. A Transformer-like device is the only “tablet” I could see myself getting, because I’d really want it to become more like a laptop replacement in the future. But of course the app ecosystem needs to catch-up, too, and I think it will in the next couple of years, to the point where you won’t really need Windows (or MacOS) for most tasks. And I agree that having Android 4.0 from launch day will probably increase the buzz around it 3-fold. But I think the Transformer will be successful on its own, too. Plus, they’ve been very fast with updates so far, and they’ve already said they’ll have Android 4.0 on it by the year’s end. But yes, Android 4.0 on it from day one would be perfect. Asus is leading the way here. In the next few years most netbooks, laptops and tablets will converge towards this design. “Laptop” form factor for when you need to do work and need to stay at a desk, and detachable tablet for when you want to use it on the couch, bed, etc for content consumption. Plus, a 15 hour “real” battery life (days with moderate usage) should be a big benefit, too. I just hope Asus is smart enough to offer the keyboard by default included in the rumored $500 price. They need to start promoting it as a complete device, rather than a tablet + optional keyboard accessory. And they need to SAY it that this is the future of tablets and laptops, so they start getting a strong following of early adopter and evangelist types. I also think Asus needs to get the idea through that the Transformer is more than a tablet–it’s a netbook when you need and a tablet when you want. While they attempted to advertise that initially the final outcome was seeing the Transformer as a table ONLY in all the stores. It just didn’t grab your attention as a multi-functional device. I also think this design will be significantly boosted with Win8–people will begin to expect their laptop to separate into a tablet.